Artisan Crafted Sterling Silver Chain Necklace (20 Inch), "Borobudur Collection II"
Dazzling with ornate detail, this necklace by Wayan Sarjana celebrates the legendary Borobudur style. It is named after the magnificent Buddhist temple in Java which was built in the 9th century as a schematized representation of the cosmos. 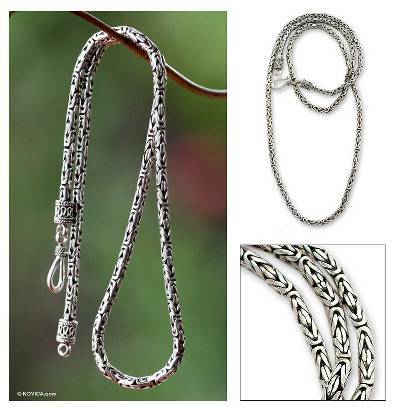 This sterling silver chain necklace is crafted by hand with amazing skill. Sarjana has steadily grown his workshop. He is eager to continue growing and hopes to be able to employ additional silversmiths in the near future. Sarjana has a diverse jewelry collection that incorporates both traditional and contemporary motifs. He learned silversmithing from his uncle, and sought out Javanese silversmiths to teach him the specialized art of traditional Indonesian handmade chains - a speciality that has been handed down through the generations. Sarjana is dedicated to preserving Indonesian silverwork and hopes to some day teach his children this art. Wayan Sarjana has received 8 microcredit loans with 0% interest from Kiva and Novica, the first for $1350 and the most recent for $6000. Proceeds were used to invest in the purchase of sterling silver for production. Novica sales account for nearly 100 percent of Sarjana's workshop income. This income supports his family and the families of his five assistants. Sarjana educated his oldest child and now provides for the education of his youngest daughter. Sarjana gives work to other silversmiths, two of whom specialize in the jawa technique. Sarjana's two children were born 15 years apart. He provides for both of them. I wear this all the time, it is so beautiful and unique!!! have received many a compliment. This chain is just as described; beautiful workmanship and weight. Thank you Wayan! Lovely, elegant, expensive looking. Substantial appearance, but not heavy on my neck. Hoping with my mild nickel allergy I can wear it. Goes well with my new elephant bangle, which is beautiful too. Hope the hook clasp will be secure enough. Arrived 2 days earlier than estimated. Love this site! "Flowers and animals are my favorite subjects, but sometimes abstract geometrical shapes come into my mind, even though they are inspired strongly by nature originally." Wayan Sarjana has fine-tuned his silver-smithing skills over the years to become one of the most talented and innovative craftsmen in his village. Sarjana, an amateur historiographer, says he returns to his roots for inspiration, elaborating on ancient Indonesian designs to create elegantly unique silver jewelry. "I was born in a village called Banjar Apuan Singapadu, Sukawati on the island of Bali in the year of 1970. I am the eldest of three children from a family of artists, but I was the first in my family to work with silver. "I started to learn at the age of fifteen as an apprentice in my village with a man called Nyoman Regig. He was a good but strict teacher. If Made one piece just a little bit wrong he would be so angry with me, but he also taught me how to work under stress and short time limits. A good foundation if you ask me! "After five years I started on my own to produce original pieces that I sold to local shops. And slowly I was able to save enough money to make my own workshop at home, where I work still until this day. "My main inspirations come from nature and the daily life around me. Flowers and animals are my favorite subjects, but sometimes-abstract geometrical shapes come into my mind, even though they are inspired strongly by nature originally. "Silver is not an easy medium to work with here, because the price changes all the time, but I cannot imagine doing anything else. "I am happy and very grateful to the team at Novica, because they help me to promote my work outside Bali and they are supportive of my ideas and understanding in regards to the different aspects of being a silversmith. "I hope that the people around the world enjoy my work and that it if there is anything I can do with my talent to contact me through Novica. "These years with Novica have brought so many changes to my life. Now I have something to be proud of, including the fact that the international world appreciates me as an artist - a silversmith from Bali. I was only selling my jewelry door-to-door before, and my life was in the hands of shop owners. With Novica I am now able to create my own life, and to earn a consistent income. There are now five people working with me. One by one they came to my place asking for work. They are happy to work with me, for almost five years now, each also happy to be a part of Novica's success -- and happy to earn more money than they ever received before." I purchased a beautiful garnet pendant with chain from Wayan and it's much more beautiful in hand than in the photos. Photos just can't do justice to the fine details on this lovely pendant. And it's made strong enough that I can and do wear it regularly, not just for special occasions. Than you Wayan. May to continue to create beautiful jewelry for many years to come.